But on to other things. We have been working on organizing our writing in sequential order this week in preparation to explain a process. 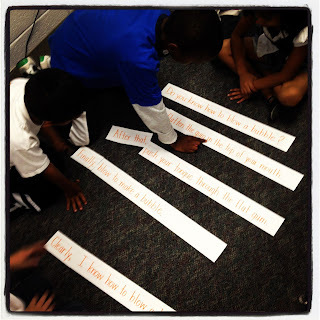 I made some sentence strips that including the topic and conclusion sentences, three details, and transitions. 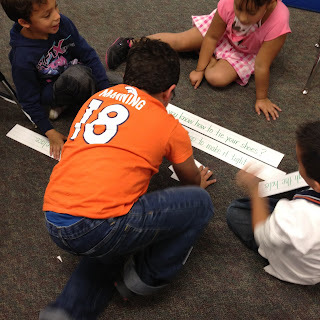 The groups had to work together to organize the strips and then decide if it made sense. The kids really liked it and it allowed them to practice their reading skills and teamwork skills. 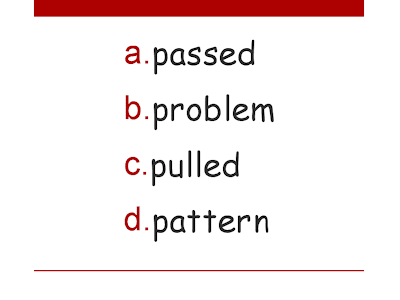 In preparations for our upcoming assessments, I made a PowerPoint to help the kids identify their high-frequency words. They are given a word verbally, and then they have to identify it from a given set of words. The PowerPoint can be used multiple times. All the words listed are from the third 100, so you can change the word you are looking for at any time. I tried to put words together that made sense, but...I was watching The Hunger Games at the same time, so hopefully there are not any mistakes! This is what the slides look like. Click on the slide to download a copy from Google Docs. Well, I'm off to start another week. Baby E is looking good and I'm looking at starting my maternity leave on October 15th. Wish me luck!